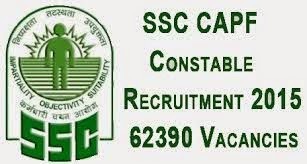 New vacancies in Indian Government: Staff Selection Commission Recruiting 62390 Constable GD & Riflemen on Feb 2015. Staff Selection Commission Recruiting 62390 Constable GD & Riflemen on Feb 2015. Staff Selection Commission has invited application form for the Recruitment of 62390 Constable GD & Riflemen. All Eligible 10th Candidates are requested to apply online or offline on or Before 23rd Feb 2015. Selection Process : Physical Standard Test (PST), Physical Efficiency Test (PET), Written Examination & Medical Examination. Application Fee : For General / OBC candidates Application fee is 50/-, for other candidates (SC/ST/women) Application Fee is Nill. How To Apply : All Interested & Eligible candidates may apply online through official website http://www.ssc.nic.in on or Before 23-02-2015. Important date to Remember : 23-02-2015.